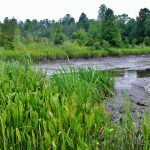 You are here: Home / Look and Learn / What-When-Where-Who of NC Wetlands / When/Where are our Wetlands? Sometimes you can’t see water in our wetlands! Wetlands can be wetlands even if you do not see water on the surface. Some wetlands can have standing water all year long, while others can be difficult to identify as wetlands, especially during dry times of the year. Wetlands just need to be wet enough, long enough to change the chemistry of the soil, and support the growth of hydrophytic (water loving) plants. Sufficient water levels within 12 inches of the surface can support wetland plants and soil chemistry. Many of the small wetlands, like depression ponds or vernal pools, are seaonal/temporary wetlands because they remain wet during the cooler/wetter months of the year, but will dry out on the surface during the dry summer months, especially if there is little rain. These wetlands are important for amphibians because it provides the water when the amphibians need it, but there is not enough water for the fish to survive. Wetlands are rarely dry on the surface year round, they will be wet at some point. Occasionally some of the wetlands can go years without holding water, but water is usually not far from the surface. Where are North Carolina’s wetlands? Wetlands occur in a variety of locations across the state. The majority of wetlands in North Carolina are in the Coastal Plain, which occupies the eastern third of the state. The Coastal Plain is closer to sea level and flatter than the middle and western parts of North Carolina. In the Coastal Plain, wetlands can be found in small depressions, in swales (low lying areas between sand dunes or ridges), along streams and rivers, and next to the sounds and the ocean. These coastal plain wetlands are located in areas that can be influenced by saltwater and wind and lunar tides. 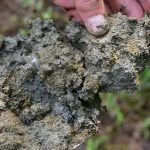 In the Piedmont, the middle area of North Carolina, wetlands are more often found as swamps or bottomland hardwood forests along streams and rivers, or at the headwaters of streams. Most are forested, but a few shrub and marsh type wetlands can be found in areas where streams have been dammed by humans or beavers. Other wetlands in the Piedmont can be found as vernal pools and small depression ponds in small low lying areas, or as seeps at the bottom of slopes. In the mountains of North Carolina, wetlands are few and far between and are often small. Many of these rare wetlands are bogs, which form in flat areas within the mountains where water collects for long periods. As in the Piedmont, dams by humans or beavers also can create wetlands, often marshes, along fringes of lakes and ponds. Some wetlands have also formed along the floodplains of streams or rivers where there are flat areas, or as seeps at the bottom of the slopes of the hills. 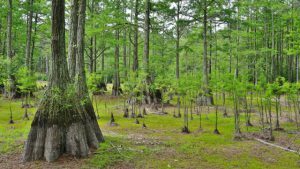 What kinds of wetlands are in North Carolina? 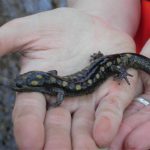 Who lives in North Carolina’s wetlands?